One of the things I do on vacation, particularly when it involves a drive, is to document the route that I take. This might seem weird, but I've found that having these documentary photos in the middle of all the other ones I take, reminds me of where I was at the time the others were taken. In the case of a road trip, it shows the route I took to get to the destination. Herewith is the trip out to Carole in Virginia. The radio came on at 5:15 a.m. I really wanted to be on the road by 6, knowing I had a, probably, 14 hour drive, with stops, ahead of me. I managed, almost in spite of myself, to be 90% packed on Wednesday night. 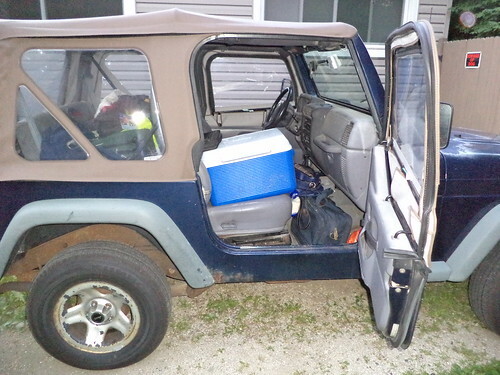 This included the Jeep. Thursday morning was merely scooping up the last of the toiletries, packing the cooler and doing one last round through the house to see if I'd forgotten something. I'd had my suitcase out since Saturday night, but I don't think it sunk in that I was leaving until Thursday morning. 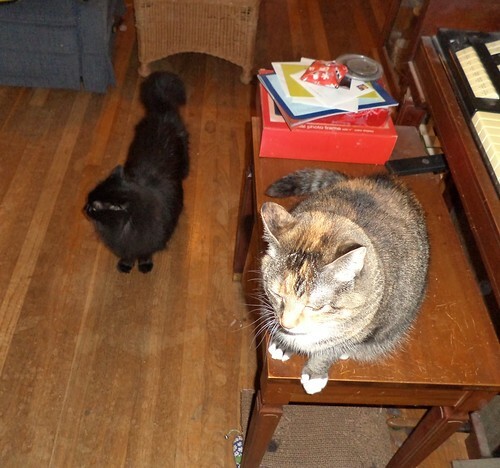 A whole bunch of treats and a lot of ear scratching and I was ready to go. 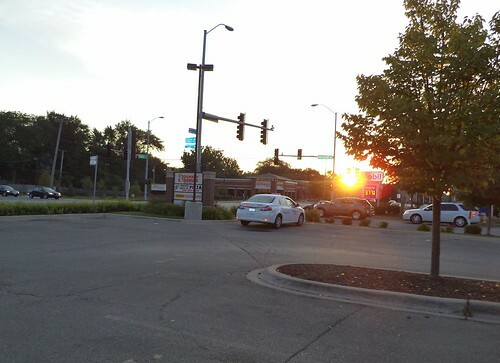 It was chilly Thursday, August 15th at 6 in the morning, but the sun had just come up. I headed to Dunkin' Donuts for tea and a couple of donuts. Once I had those, it was really time to head east. 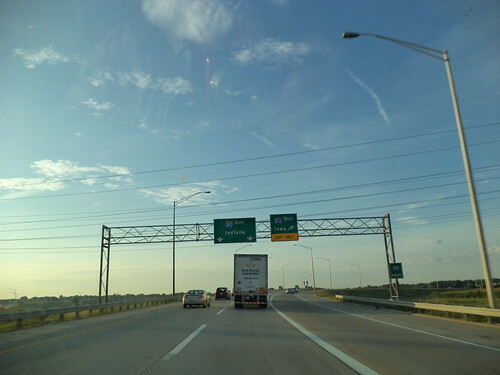 First Interstate is I-355 which runs north south from I-80 in the south to I-290/90 in the north, west of Chicago. If you get a map out, you can follow along. 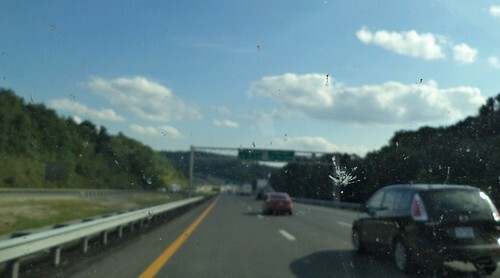 Yeah, the inside of my windshield is not the cleanest. I wiped it down when I stopped for gas in Indiana. I headed south on I-355. This is a very familiar road. We do business in the far south suburbs of Chicago and NW Indiana so I have had occasion to travel this route quite a bit. 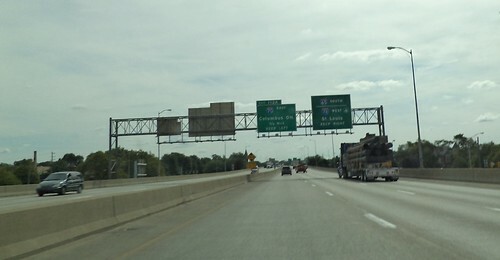 At the south end of I-355, you meet I-80. Time to head to Indiana and not Iowa. I stayed on I-80 until it met I-65. I took that and headed south to Indianapolis. Somewhere along this route, the time went from Central time to Eastern time. That was one reason I wanted to leave when I did. It's a 14 hour drive from MY time but it seems longer because there's that time change. I drove through Indianapolis and picked up I-70 east to Columbus, Ohio. 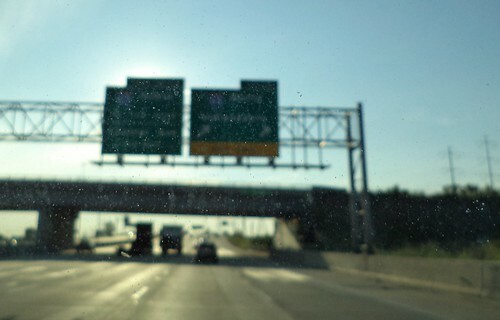 It was around the noon hour when I got to Indianapolis but traffic was light and moving very well. I-70 had road destruction on it. I had looked at the web sites for all the states through which I would be driving and had not seen anything regarding road construction on Indiana Interstates. It's kind of disheartening to suddenly have traffic reduced from 70 to 45 when you weren't expecting it. 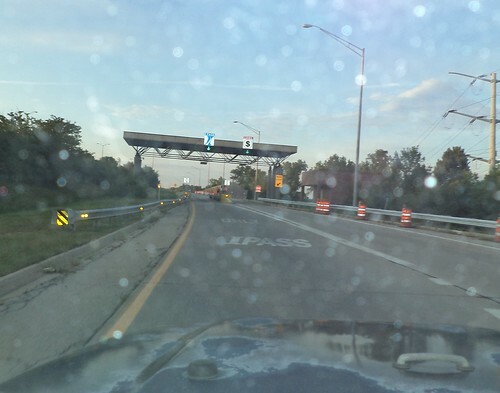 Just after entering Ohio, I arrived at the junction of I-70 and I-75. 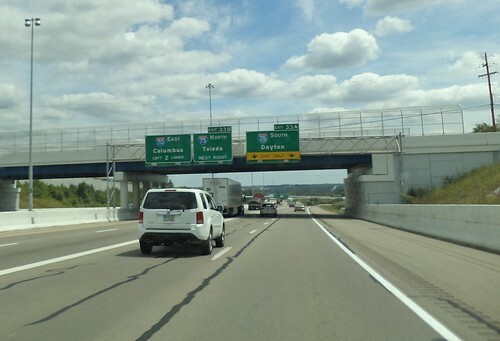 I went to the right and took I-75 south toward Dayton. It was the road destruction to the west of Dayton's downtown that convinced me to take an alternate route home. They are completely rebuilding the interchange with US 35, which was the road www.bing.com/maps told me to take east southeast toward West Virginia. Bridges are being reconstructed. On and off ramps don't exist. I missed the exit for US 35 but they had, clearly marked, an alternate for those people who realized they'd missed the exit. It was a mess. So I picked another route home. US 35 is, in Ohio, a 4-lane, well-maintained highway. I couldn't imagine, when I got the directions, why this route would be selected. 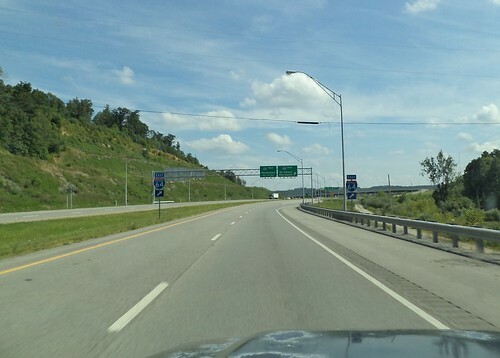 If the interchange with I-75 hadn't been under construction, I would have come back this way because I made very good time; good time UNTIL US 35 crosses the Ohio River and gets into West Virginia. Then, it shrinks from 4 lanes to 2 lanes. It's a major arterial in that region and I found myself car #5 behind a motor home doing 45. Plus, the road is being resurfaced. Suffice it to say, that was the slowest travel time of the entire trip. 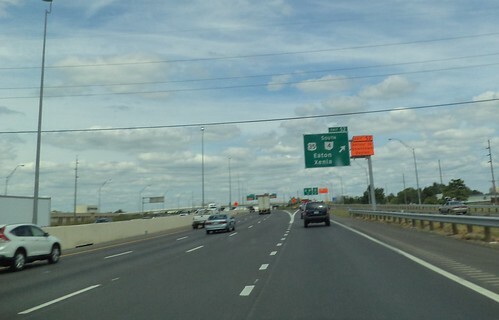 When US 35 became 4 lane again, I was thrilled. Shortly after that, though, came the intersection with I-64. I would stay on I-64 for the rest of the trip. 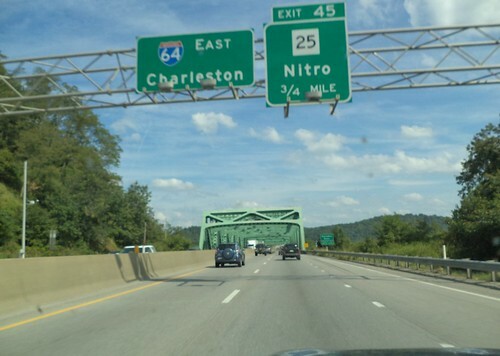 First, I passed by Charleston, the capital of West Virginia. Once across the river on the east side of Charleston, I got on the West Virginia turnpike. I was so very glad I had an IPass. I didn't have exact change with me at the time. 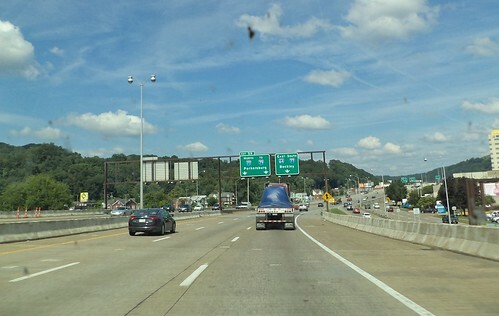 At this blurry intersection, I-64 leaves the West Virginia Turnpike and heads up into the mountains. You can see how great a day it was to drive. It was actually cool and I never had the windows down because, when I did that, it was too chilly. I stayed on I-64, heading east to Richmond. In western Virginia, it joins with Interstate 81 and runs the Shenandoah Valley north south. That's a lovely drive, which I did on Thursday, August 22nd. 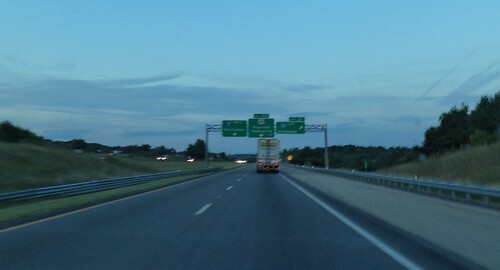 South of Staunton, Virginia, I-64 goes right toward Richmond. The directions for getting through this interchange were incredibly confusing and involved going north on I-81, getting off, going through this industrial area, going back south on I-81 and then east on I-64. I was so incredibly worried I'd get lost because I'd be coming at this at, as you can see, dusk. But you can see in this photo, there's simply an arrow to the right. Obviously, those directions were inaccurate. I just veered right and was on I-64 heading to Richmond. This would be the last photo documenting the route to Carole's. I pulled into her apartment complex at 9:30 p.m. She said she was the last building in the complex that was parallel to the drive. She's not. 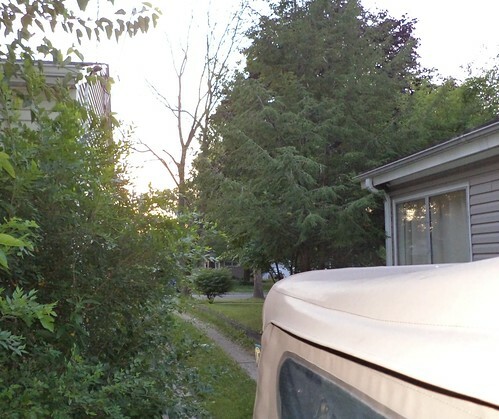 There is another building farther back. I got confused because I couldn't find the building number. She was at a concert. So, I just parked the car and sat. I was there. I'd made it. I was tired but in a good way. Best of all, unlike a lot of my recent road trips, nothing had gone wrong with the Jeep. Now to enjoy a week with my daughter.